Watsons kicked off its 2018 Ramadan and Aidilfitri campaign by calling upon Malaysians to propagate a do-good culture by sharing acts of kindness. With the #MisiIkhlasAidilfitri campaign, Watsons aims to spread positivity and shine a light on the kind and sincere acts performed by Malaysians every day. 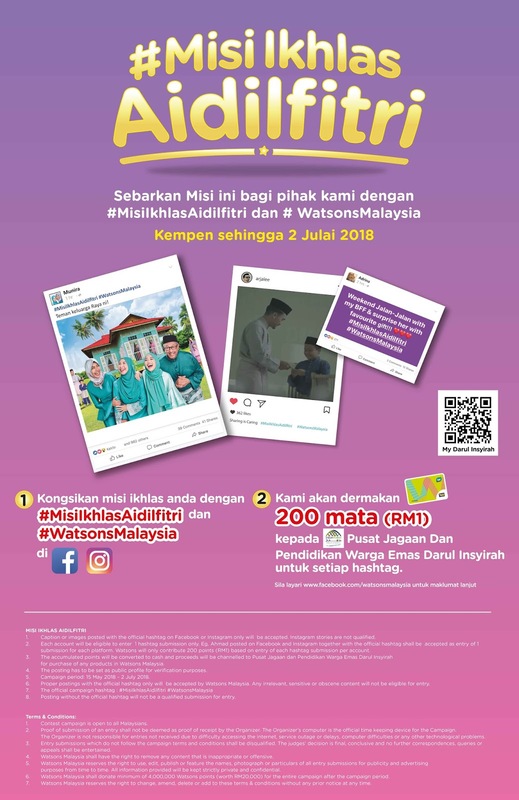 At the same time, the campaign will drive contributions from Watsons Malaysia to the Pusat Jagaan Dan Pendidikan Warga Emas Darul Insyirah home with every use of the hashtags #MisiIkhlasAidilfitri and #WatsonsMalaysia. The #MisiIkhlasAidilfitri campaign, which runs from 15 May to 2 July 2018, calls upon Malaysians to share acts of kindness that they encounter or hear about, on Facebook or Instagram, using the hashtags #MisiIkhlasAidilfitri and #WatsonsMalaysia. With each use of the hashtags, Watsons Malaysia will donate 200 points (equivalent to RM1) to Pusat Jagaan Dan Pendidikan Warga Emas Darul Insyirah, which will enable the organisation to purchase products from Watsons, from toiletries to medicines and vitamins, for the needs of the old folks residing in the home. "During Ramadan, the holiest month in the Islamic calendar, it is a time of spiritual improvement and performing good deeds for Muslims. With the #MisiIkhlasAidilfitri campaign, we want to appreciate the good deeds of our fellow Malaysians on social media and to spread positivity. By shining a light on these kind and sincere acts, we want to spread the joy of doing good and bring people together in a world that has become increasingly fragmented,” said Caryn Loh, General Manager and Country Head of Watsons Malaysia. Loh said these good deeds range from simple acts that can brighten the day, such as smiling and greeting the people you encounter, adopting a pet from a charity or opening the door for someone, or acts that have a much bigger impact. Watsons Malaysia will also be highlighting extraordinary acts of kindness on their social media channels, such as the man who sold his Proton Iswara to a single mother for 10 sen and the Malaysians who came together to help following a major accident in Ipoh. #MisiIkhlasAidilfitri is a first of its kind effort by Watsons Malaysia that brings together Malaysians to participate in the spirit of this holy month. “Our campaign is all about demonstrating that no person, message or story is too small to make a difference. Through the campaign, we are asking people to share social media messages that inform, inspire and create awareness that can bring about social change or perhaps just uplift all of us, when we read about the kindness and goodness of our fellow Malaysians. This Ramadan, we want Malaysians to feel great, besides also looking good with Watsons Malaysia,” Loh added.